Custom Sticky Pads – You can avail them in different pastel or neon colors depending on the choice and by bulk ordering, you can grab them at throwaway prices such as $0.33 to 0.99 depending on number of pages, imprint area and other specialties. Custom Coupon Sticky Pads – These sticky pads are very popular on the gifting scene and largely preferred by food marketers and hospitality marketers trying to find their foothold in the niche. On bulk ordering most marketers can avail it at best buy prices such as $0.56- $0.87 depending on their size, number of pages and imprint area. Custom Scratch Notepads –Logo imprinted custom scratch notepads are popular choice for intra -business value building and used in offices, schools, and business places for information management or quick reminders. They are offered in different price ranges $0.24 – $0.93 depending on the number of sheets, lines and other specifications. Custom Shaped Notepads – Although the choices are limited, still you can make a good deal out of it. You can get them in various interesting shapes such as ribbon, truck, house and flag and in price range $0.53- $0.86. You can buy adhesive and non-adhesive notepads under this category. Custom Sticky Flags – Are you scratching your head to find a value effective promotional choice for your next corporate campaign, panic not, seek custom sticky flags. It falls light on your marketing budget and even lighter, when carried in bulk or when used to label something! The flag inserts can be availed in 8, 13, 14, 16, 80, 160 leaves depending on the choice. 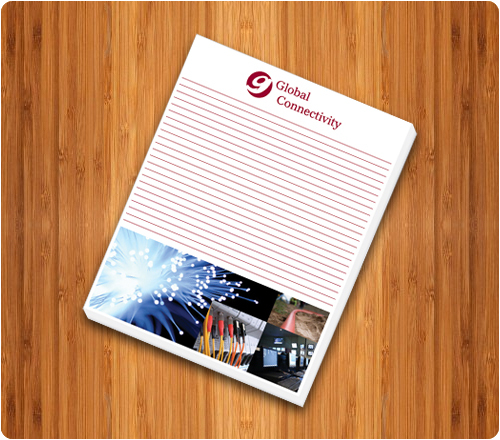 Custom Notebooks – Custom spiral notebooks have been very popular gifting choice for many corporate businesses and they are largely preferred for building intra-business and inter-business recognition. There are not many choices for these notebooks under $1 but the available ones are good enough to take you closer to your targeted customer base and strike good rapport with them. These notebooks can be availed $0.85-$0.98 depending on the choice. The recycled jotter and pen with colored trims makes an inspiring gifting choice in this category. Custom Memo Books – These custom memo books make an eligible and elegant choice for business gifting throughout the year because people always love such specialized gifts. These memo books can be availed in price ranges $0.35-$0.78 and offered with imprinted protective cover and pen. You can hand them during corporate events or as a complimentary token along with festive purchases or as a small token of acknowledgement during tradeshows or business conventions. Custom Magnetic Notepads – If you see around, custom magnetic notepads are all-time best sellers on any online store stocking custom notepads or other office stationary. Marketers of all niches, budget sizes, and interests can avail them for value building. These notepads feature a space for managing business cards and they come of great use for managing grocery lists, things to do and many more. People love managing them over refrigerator doors or other visible spaces within office or home. On bulk ordering, marketers can avail these magnetic notepads in price range $0.41- $0.91. If you are new in the niche, then you can straightly proceed to any online store stocking these custom notepads. Do not forget to check, if the store is one of repute and offers you enough choices for under $1. You can also expect to enjoy benefits such as free shipping, free art setup, and free online design proof along with your purchases.